Every year or so, a special medical team made up of Navy special forces and Marine Corps combat hospital corpsmen (all of whom receive special and intensive training as “first responders” in combat casualty care) visit our Embassies (at least in the part of the world where he was then stationed) to train the local Embassy security team how to respond, essentially, to shooting incidents. This week-long training includes some pretty intense life-saving trauma damage control techniques – hemorrhage control with tourniquets, pressure dressings and hemostatic agents, placing chest tubes for tension pneumothorax, treatment of shock with fluids, stabilization of fractures, and more. Early in this fiscal year, the local security boss (Regional Security Officer) at my son’s Embassy invited representatives of the host nation’s Presidential Guard to observe and participate in the training. To say that these men were blown away by the level of sophistication – and effectiveness – of the training, and its implication in their own work for their nation’s leaders, would be an understatement. Not only were they seen gathering up the wrappings of all the specialized materials used in the training (“where can I get this stuff?”), they made very clear their dream to receive similar training for their entire team. I don’t know if that special training ever materialized, but the message is clear: this is the kind of medical diplomacy, done at a very “local” but hugely impactful level, that can build good will – and friendship – that will last. The shame is that it happens “under the radar” and might not be seen by those in leadership who could use this kind of training to build good will throughout the world. Every time I read about some gutless dim-bulb who advocates surrender rather than serving his country in a time of need I am reminded of our pill rollers. There is little doubt that many of the gentlemen who served as medics in WWII were conscientious objectors, but they didn’t run and they were major contributors to our ultimate victory. Admittedly, back in the states (where every rookie is a self-appointed hero) those of us who were silly enough to think war a glorious adventure made bad jokes about the moral fiber of aid-men. We should have had our mouths washed out with yellow, GI soap! Much later, in combat, our definition of bravery underwent some startling changes. It turned out that 90 per cent of us were scared blue; we performed our duties, but it was no piece of cake. I’m sure the medics were scared too, but I never saw better soldiers. Indeed, if comparisons are necessary, then I held these crusaders of the red cross on an absolute par with the crazy, wonderful gladiators of The Big Red One, the Ninth, the Screaming Eagles – and the best of our own superb Spearhead warriors. Today I’ll buy drinks for any aging character who admits that he was a medic in the big leagues. Whether they were company aid-men or battalion, we got to know our pill rollers in combat. They were gentle men. Few of them wanted to kill, yet they lacked no intestinal fortitude. They were as beat-up and dirty as any of us, but they were angels of mercy toting plasma and sulphanil-amide and bandages – and hope. Ever stop to think that the medics are directly responsible for the fact that many Spearhead veterans are getting old? One of Woolner’s sage maxims is an observation that aging is an alternative; otherwise one dies young. A certain company aid-man I knew rather intimately, due to mutual suffering in basic training and later operations in assorted beer joints, may have been typical. Maybe I should name him, but I won’t – other than to say his first name was John and he originated away back East. This guy was well-read and cultured, really officer material, yet he shook his head at the thought of killing other human beings. John went AWOL out of Camp Hood, Texas, eluded all of the MP’s, thumbed his way back East and married “that girl” in his life. Then he returned to face the music. They gave him a month of hard labor, and he took it in stride, never complaining. Hard labor wasn’t much fun. On several occasions I had to be watch-dog and, once, having fouled-up a given task, I had a day of it myself. You dug latrines, broke rocks and raked sand. It was dawn to dusk under armed guard. The hard labor boys were temporary second-class citizens, and you’d better believe it. John felt that his “crime” was worth the punishment. Laughing it off, he served his sentence and went back to company duty, a buck private with no immediate dream of advancement. That man served with distinction when the guns began to pound; he was a hell of a great soldier. Spearhead brats must realize that a red cross on arm and helmet was no armor, yet these characters scurried out under the heaviest of fire to rescue the wounded. Lots of them were killed in action, daring too much. Some were slaughtered by the spiteful SS, but more caught it because machinegun fire and artillery is indiscriminate. The rank and file of the German Army respected aid-men. Often, in surrounded pockets. Kraut and GI medics worked together to save the lives of soldiers of both sides. There may have been medics who dogged it, but I never saw one. To those of us up front they were all heroes, and I might add that our standards were pretty high. How else do you rate a man who darts out of cover during a tremendous bombardment to succor the wounded? While brave infantrymen were crouching in foxholes and tank commanders tried to get hull-down and inconspicuous, these wonderful bastards answered every call for help. Commanders reap most of the glory and combat troops harvest a lion’s share of medals, but talk to “old soldiers, broke in the wars,” and you’ll find their greatest praise reserved for the unarmed medics who didn’t want to kill anybody, but who had the guts to conquer fear, to dive into a furnace and save the lives of comrades. No braver men ever served America. I’ve written about hospital ships before. Since then, I have privately wondered if there was a combat-casualty role for them in the modern world of sophisticated forward combat care hospitals and air transport to evacuate the most severe combat casualties to the highest levels of care. Moreover, big gray ships are increasingly being fitted out with sophisticated medical capabilities. In my posting on hospital ships, I mentioned the German Berlin-class Fleet Support Ship as an example. US amphibious ships, intended to provide support for Marine Corps operations, are all fitted out for surgery; the new USS America (LHA 6) will have expanded medical spaces in view with her capability to take on casualties by helicopter evacuation. (1) With this apparent move away from big white ships with big red crosses, whither hospital ships? Enter the PLAN’s Peace Ark. 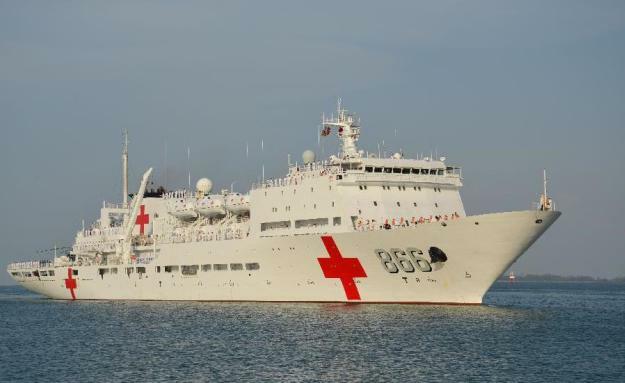 This bwswbrc, the only Type 920 Hospital Ship in the Chinese inventory, possibly the only active PLAN hospital ship of any class, made a dramatic appearance at the recently concluded RIMPAC 2014 exercises. The Naval Institute news blog carried a nice article on the ship on 23 July. (2) Featured was Senior Captain Sun Tao, identified as the officer in charge of the ship’s medical detachment. Captain Sun told his interviewers that, when not under way, the ship carries a crew of 113 and a 20 person medical detachment. When at sea, the crew would increase to 300+ and the medical detachment to around 100. While capable of receiving war casualties by helicopter, boat or high line, it appears that the ship has been used mainly for humanitarian / public affairs visits since it was first deployed beyond Chinese waters in 2010. Her most recent overseas activity was a humanitarian mission to the Philippines after super typhoon Haiyan. capabilities. Interestingly, even her life boats are equipped to handle up to 18 stretchers or 24 ambulatory patients. 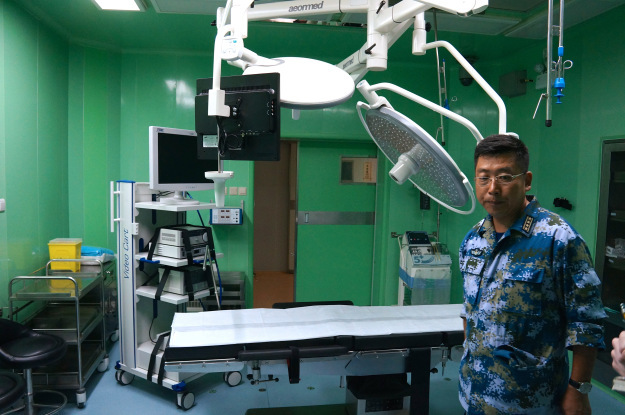 Captain Sun showed off a gynecological examining room; this was a space, he said, that was particularly useful during humanitarian missions. Given that navies of the world are apparently building ever more med-surg capability into big gray ships that are capable of protecting themselves against terrorist attacks, one is left wondering if hospital ships have any military utility at all. On the other hand, the dramatic good-will advertising power of a big white ship with big red crosses showing up in times of humanitarian need, makes the civilian utility of such vessels pretty obvious. Chaplain Dave Thompson, USN, RET, has become something of a regular correspondent. Regular Readers may remember that the 1918 Influenza pandemic is one of my core interests, so when Dave sent this piece on flu and combat deaths among Wisconsin soldiers, I took notice. Now you can, too. Jim also mentions efforts to create a World War I Memorial on the National Mall in Washington,DC. I came across an interesting document yesterday demonstrating the impact of disease to combat deaths of a 50:50 ratio in WW I. The Gold Star List is quite a document and testament of the huge role disease played in WW I. “Wisconsin’s Gold Star List: Soldiers, Sailors, Marines, and Nurse casualties for WW I”, was written in 1920 shortly after WW I and spells out in detail the cause of death of all Wisconsin service personnel in WW I (see: http://www.accessgenealogy.com/worldwarone/wisconsin/ ). The Wisconsin Gold Star list encompasses soldiers, sailors, marines and nurses who were casualties from that state by county listing in WW I (click on any county to look at the list). The Wisconsin WW I Gold Star List takes cold national statistics of 50,280 combat deaths, 57,000 deaths to disease (with 52,199 being American troop deaths due to the pneumonia/influenza epidemic of 1918), and the remainder due to suicide and accidents to make up 116,000 deaths of American Service personnel in WW I… and it personalizes these large casualty figures into cause of death and assigns real names to people who “just lived down the block” from our relatives, before going off to war and never returning. It helps us better remember all those who lost their lives in World War I due to combat action or the Great Influenza/pneumonia Pandemic of 1918. What makes Wisconsin WW I Gold Star List so unique is, outside of North Carolina, to my knowledge, no other state did this kind of historical retrieval of information on WW I casualties and put it in one organized place like this for states to commemorate WW I (usually the names of Army personnel are buried in Army division casualty lists and are not organized by state to see the impact of World War I upon a state and counties and cities within their boundaries. This document really brings the cost of war home to Wisconsin residents, who knew these people or their families. Many grand-children and great-grandchildren will recognize their loved on from such a list and it makes more personal for all American the cost of World War I in human lives. Also, what makes Wisconsin a rather unique study of casualties is: It gives a much more balanced reporting of casualties at home in WW I U.S. military training camps where some 30,000 service personnel died of the flu, as well as identifies flu/pneumonia deaths and other diseases WW I servicemen suffered with the AEF in Europe, along with combat casualties and death from wounds and accidents. Any objective reader of these lists can see the stark, almost equal proportions of casualties between those who lost their lives to disease (mostly to pneumonia, which was the last stage of the influenza that raged through our armed forces in 1918 during WW I)… as well as listing those who lost their lives due to combat action with the American Expeditionary Forces in Europe WW I. The 32nd Red Arrow Division from the Wisconsin National Guard was involved in heavy fighting in Europe involving its citizen solders in heavy combat, unlike many other states that never got their National Guard units overseas. The 32nd Division suffered the 3rd highest casualties of AEF Army Divisions in WW I, 13,261 casualties (2,250 KIA & 11,011 WIA) in WW I. They were in the thick of the fighting in the Meuse Argonne Offensive when the Great Influenza/Pneumonia Epidemic struck our AEF forces in Europe in 1918. The 32nd Division was also used in post-war occupation duty in Germany and some of its subordinate units were used in an expedition to Russia to support the White Russian Army against the Red Army in 1919 (suffering casualties to disease, including the last wave of the influenza/pneumonia epidemic in 1918-1919). They came home to Wisconsin in the summer of 1919, serving much longer after World War I than many other Army units and WWI soldiers who were not part of occupation duty and were demobilized much earlier. The Gold Star List records deaths due to combat action (killed in action or “KIA” or Died of Wounds or “DW”), accidents, suicide, murder, and death due to disease or “DD,” spelling out the specific disease that claimed their life…including many influenza and pneumonia deaths caused by the 1918 Flu Pandemic. (1) Ashland Country (Northeastern Wisconsin): 39 casualties, with 23 dying of disease (19 by influenza/pneumonia and 4 by other diseases) and 16 dying from combat (14 KIA and 2 died of wounds). (2) Brown County (East central Wisconsin around Green Bay, WI): 46 casualties, with 28 dying of disease (23 by influenza/pneumonia and 5 by other diseases) and 18 dying from combat(12 KIA and 6 died of wounds). (3) Dane County (South Central Wisconsin near the State Capitol in Madison, WI) : 142 casualties, with 77 dying of disease (60 by influenza/pneumonia and 17 by other diseases) and 65 dying from combat (52 KIA and 13 died of wounds). (4) Douglas County (Northern Wisconsin around Superior, WI on the border with Duluth, MN): 51 casualties, with 27 dying of disease (23 by influenza/pneumonia and 4 from other diseases) and 24 dying from combat (15 KIA and 9 died of wounds). (5) Eau Claire County (North Central Wisconsin near Eau Claire, WI): 50 casualties, with 29 dying of disease (27 by influenza/pneumonia and 2 from other diseases) and 21 dying from combat (19 KIA and 2 died of wounds). (6) Fond du Lac County (South Central Wisconsin near Fond du lac, Wisconsin): 77 casualties, with 34 dying of disease (28 by influenza/pneumonia and 6 from other diseases) and 43 dying from combat (29 KIA and 14 dying of wounds). (7) Kenosha County (southeast corner of Wisconsin near Kenosha, Wisconsin on the Illinois border): 43 casualties, with 23 dying of disease (21 by influenza/pneumonia and 2 from other diseases) and 20 dying from combat (13 KIA and 7 dying of wounds). (8) La Crosse County (southwestern Wisconsin near La Crosse, WI on the southeastern border of MN): 55 casualties, with 29 dying of disease (24 by influenza/pneumonia and 5 from other diseases) and 26 dying from combat (14 KIA and 12 dying of wounds). (9) Milwaukee County (south eastern Wisconsin near Milwaukee, WI): 387 casualties, with 165 dying of disease (118 by influenza/pneumonia and 47 from other diseases) and 222 dying from combat (183 KIA and 39 dying of wounds). (10) Waukesha County near Waukesha, WI in southeastern Wisconsin, a western suburb of Milwaukee, WI): 61 casualties, with 43 dying of disease (38 from influenza/pneumonia and 5 from other diseases) and 19 dying from combat (15 KIA and 4 dying of wounds). This state sample from Wisconsin squares pretty much with national statistics of the close to 50:50 ratio between casualties to combat and those to disease in WW I.
Hopefully the newly created WW I Centennial Commission created this year and any WW I Memorial that may be created on the Mall in Washington, DC might reflect this balanced perspective on WW I casualties and tell the story of WW I to reflect the losses both in combat and to disease in The Great War. This is an interesting and valuable document that tells in a more balanced way the terrible cost of war and the role disease (especially The Great Flu Pandemic of 1918)… as well as combat… and how it played out in this conflict, which claimed the lives of 116,000 servicemen (many whom have yet to be properly recognized in a National WW I Monument or in our many county, state or national museums covering World War I.
I hope you find this interesting and helpful information to include in the WWI story, as we prepare for the Centennial of WW I and consider an effort to have a National WW I Monument built on the Mall in Washington DC by 2018. Guilty of Murder in the First Degree. Monday was the Martin Luther King, Jr. holiday. Gina and I went downtown to a theater to see the President’s inauguration speech on a really big screen. But for the rest of the day, well into evening, we watched network coverage of the day’s events in the comfort of our toasty warm living room. The Judge had other hearings on Tuesday, so we were “off” for another day. On Wednesday, everyone, including the final defense witness, showed up. The testimony took only a few minutes to complete, and Counsel rested her case. Next, the Judge literally read the jury instructions to us. The DA made her final argument, about an hour long, and we broke for lunch. In the afternoon, we heard the Defense Counsel’s argument and the DA’s rebuttal. After some additional “procedural” instructions from the Judge, the bailiff escorted us to the Jury Room. The one remaining alternate juror – one replaced juror number six when he came down with the flu about 3 days into the trial – received the thanks of the Court and went home. The Jury Room was surprisingly small – just enough room for us to barely circulate around the table, upon which the Bailiff had piled paper bags of physical evidence. Fortunately, there was a coffee maker and a water dispenser, along with a canister of ground coffee of uncertain age. While not of gourmet quality, it did serve to keep the coffee-drinkers among us “in the game”. The room had a wall of windows, so our deliberations occurred in the light of a bright California sun. To our universal relief, one juror volunteered to be our Foreman. After a vote of confirmation, he started us off with an around-the-table session where we could say what we thought of the trial, and, if we wanted, to express our opinion about the defendant’s guilt or innocence. At this point, it was pretty apparent that three of our number were entertaining “reasonable doubt” about guilt. No one asked for a vote, though. We were content to sleep – or not – on our individual considerations of the evidence and testimony. We reconvened at 10 the next morning. The Foreman and two other jurors then took us, point by point, through the elements of the evidence and testimony: did it establish convincingly that the defendant was in the area at the time of the murder? did it convince us of the weapon that was used? what was the motive for the crime? was the crime gang-related? The answers to some of these questions were not direct, particularly because the one eyewitness to the crime was a hostile witness who refused to actually name the murderer in Court. At one point, we requested the testimony of two witnesses be read to us. For this the Court was reconvened, with all the actors – Defendant, Counsel for Defense, District Attorney and Judge – present. After brief instructions, the Judge excused herself, and the Court Reporter read the requested testimony. Back in the Jury Room, we worked without break – pizza was ordered in for lunch – and at the end of the day, we took a secret ballot vote: 11 -1. At 4.30, we called it a day. We needed to sleep some more on the information we had. Friday morning saw us present and cheerful at 10. We did another review of all of the points of evidence. We agreed to another secret ballot, this time with each voter writing his or her points of uncertainty. You could feel tension in the air as the Foreman opened and read each ballot. The tension quickly broke when the final ballot made it unanimous: guilty. Bailiffs escorted us to a nearby restaurant for lunch, and when we returned, we set about deciding the other allegations: use of a weapon – an easy “guilty”, and a crime performed for the benefit or in association with a street gang – not convincing, as jurors saw an element of personal vendetta in the murder act. The Foreman signed off on all of the verdicts and we once again rang for the Bailiff. Court convened in very short order, and once again all the actors were present, this time with an audience section well filled with what we presume to be families of both victim and defendant. The Judge directed the Foreman to hand the Verdict form to the Bailiff, who delivered it to the Judge. After briefly perusing it – showing no reaction whatever – she handed it to a Clerk of the Court who read the verdicts out loud. The Judge asked Counsel if she wanted us individually polled – one of the jurors had cautioned us that this might happen – and she said, “Yes”. The Clerk then intoned, “Juror Number One, did you vote ‘guilty’?” “Yes.” “Juror Number Two, did you vote ‘guilty’?” “Yes.” “Juror Number Three….” With the polling confirming our unanimous vote of guilt, the Judge thanked us for our service noting that it is difficult to obtain juries for long and difficult trials like this one. The bailiff escorted us out of Court through a door at the front of the room, so we didn’t have to see the families’ reactions. Two jurors, however, had noticed that both mothers cried at the announcement of the verdict. One juror said that the DA mouthed, “Thank You” to us as we filed out. It was an amazing experience, and I’d serve again in a trice. Each juror took the duty very seriously, and while there was humor – at one point, one of us called out to another in the bathroom, “Is it Number One or Number Two?”, as we were plumbing the definitions of Murder in the First Degree and Murder in the Second Degree – we all felt the serious nature of our task. Several jurors had kept quite detailed notes during the trial, and where two or more of their notes confirmed a point of testimony, this was very valuable. I was especially taken with the respect each of us had for the others: there was no bullying argument or rolling of eyes. Each and every juror spoke out with opinions, questions, reasoning; or a comment on some nuance in the testimony that the rest of us may have missed. One juror expressed the need to be “fair” and to re-weigh selected bits of the testimony, and this was respected without impatience. In the end, in the Courtroom, every juror’s “Yes” was spoken with a firm voice of real conviction. Jury duty prevents my doing any research or writing this week, and probably next. I take this civic duty very seriously. Even though we were scheduled to fly to DC for the inauguration, I told my wife that should I be selected, the trip would be off. This is a murder trial, and because I’m a surgeon, I fully expected – based on comments from a friend who’s a San Francisco District Attorney – I’d be dismissed, based on a peremptory challenge from one of the attorneys. Because this is a high-stakes trial, I imagine, jury selection seemed especially laborious. I was among nearly one hundred prospective jurors who convened at the appointed time on Wednesday 2 January. After some preliminary housekeeping, 12 prospective jurors and 6 prospective alternates were selected at random; the rest of us followed them into the courtroom and took our places in the audience section. The judge briefed all of us: the charge is murder with a firearm; expect the trial to run three or four weeks. Court staff handed us a questionnaire that asked the usual “what’s your address?” questions, but also if we knew anyone who worked in law enforcement, or if there was anything about this trial that might prevent us from weighing the evidence with an open mind and deciding a verdict. The judge keyed on those last questions when she questioned each potential juror. She also identified the individuals for whom a month-long trial would create hardship: college students with imminent return to classes; moms with children under five; small business owners whose absence would cause a financial hit. The judge released them all. Two people told her their Christian belief that only God could determine guilt or innocence; they went home. When I told the judge and the lawyers that I had an appointment in a week, I thought for sure it would mean my exit as a juror. Silence from all three. The judge’s final questions to all were, “Can you weigh the evidence without bias?” and, “Can you keep an open mind?” Then the lawyers – first the attorney for the defense, then the District Attorney – questioned each. Finally, the peremptory challenges: each lawyer named the jurors they wanted excused with thanks. As prospectives were dismissed, the court clerk called names from the rest of us at random to fill empty seats in the jury box. The Q & A sequence repeated until late Friday afternoon. I was third from last to take my seat – juror #10. But we ran out of prospective jurors with empty seats remaining in the jury box. The judge told us to return at 9.30 on Monday. With a new crop of prospective jurors, we repeated the questions, dismissals, questions and challenges until Wednesday afternoon, when, with only a few people remaining in the audience section, the jury, with me still in chair #10, were sworn in. The judge selected two alternate jurors from a reduced pool of four. She gave us her instructions, and the DA called her first witness. Our days start around 9.30, except on Tuesdays, when the Judge’s court hear other cases, hearings and motions. We get a mid-morning and a mid-afternoon break, and an hour and a quarter for lunch. We heard the DA’s witnesses for a week; on Thursday, it was defense council’s chance to create a reasonable doubt in our minds. Defense’s first Friday witness was an apparent no-show so Her Honor granted us an extra-long weekend. We reconvene at 9.30 on Wednesday. Next week: Deliberation? A verdict? 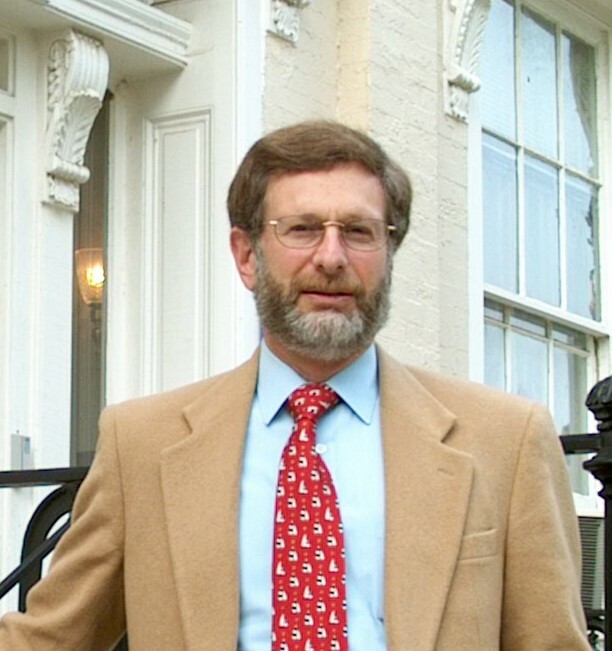 The Society for the History of Navy Medicine, “sponsor” of this blog, came into being in 2006 after discussions between your humble blogger (and Society founding executive director) and André Sobocinski, historian at the Navy Bureau of Medicine and Surgery. André noted that while several people cycled through the Historical Office on research missions, there was no real scholarly “home” for people who are interested in that narrow little corner of history that is maritime medicine. Thus challenged, yours truly, with André’s enthusiastic support, set about to establish the Society. But all of this good work may come to an end in 2013. At the April 2012 Foundation Board meeting, I announced my intention to step down as Society executive director – on my 70th birthday – in April 2013. The Society, I feel, needs new energy and new ideas. And, from a strictly personal standpoint, I have some historical work of my own – the history of the Naval Hospital at Mare Island, CA (the Navy’s first on the west coast), and other projects – that I’ve been neglecting and want to complete in the remaining time allotted to me in this world. Since that announcement, I have searched for my replacement in this volunteer and altogether felicitous job. But to no avail. Now, with no one at the helm, a Society, like a ship, must necessarily founder and sink. To avoid that fate, unless a new executive director appears on the scene between now and April, this vessel of scholarly support will go out of commission, and the blog you are reading will become – history. Earlier this year we organized “AMC-MAG” with three Missions: – to provide for camaraderie among Albany Med alumni who’ve served in uniform; – to support AMC students currently enrolled or interested in enrolling in the Health Professionals Scholarship Program; – to inculcate a culture of philanthropy to the College. I believe that ours is the only such organization in an American medical school. the view from a mid-career officer’s standpoint. 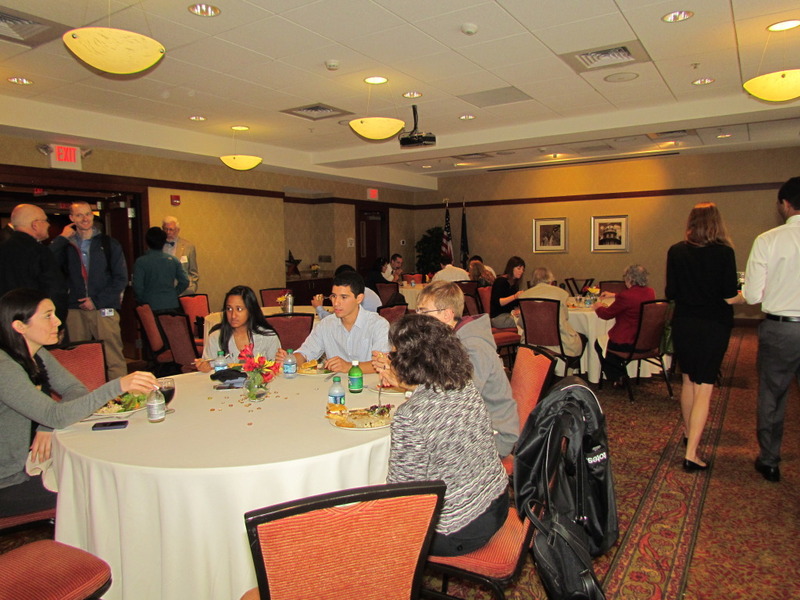 At the completion of our panels, we retired to the Hilton Garden Inn across New Scotland Avenue from the medical center for a leisurely lunch and conversation. Our first-time-ever effort was quite well received. Both students and panelists expressed the desire to see a similar event next year. 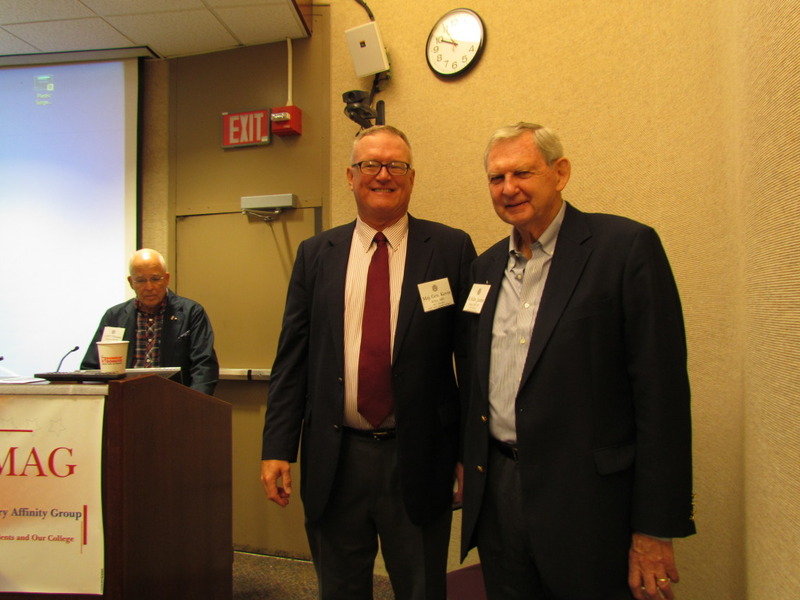 The Society for the History of Navy Medicine has a relationship with AMSUS in that he have mounted a panel at the organization’s annual meeting and plan to do so in future. Given that, the announcement here should be of interest. I received it in this morning’s email traffic. The AMSUS Board of Managers is delighted to announce the selection of retired Vice Admiral Michael Cowan to serve as AMSUS Executive Director. Doctor Cowan will follow retired Major General George Anderson in this key leadership role. Doctor Anderson has served as Executive Director since 2005 and will complete his time at the helm in November, 2012. AMSUS is the Society of Federal Health Professionals. The society was organized in 1891 and chartered by Congress in 1903 to advance the knowledge of healthcare within the federal agencies and to increase the effectiveness of its members. It is dedicated to all aspects of federal medicine – professional, scientific, educational and administrative. Presently our nearly 8,000 members represent all healthcare disciplines and serve in the Active and Reserve Components of all of the uniformed services as well as the Department of Defense and the Department of Veterans Affairs. AMSUS will host its 118th Annual Meeting in Phoenix this fall, and Admiral Cowan will become Executive Director following that convention. He will continue to serve on the AMSUS Board of Managers and as the AMSUS Awards Committee Chair until he assumes his new role. Prior to retiring from the Navy Admiral Cowan served as the 34th Naval Surgeon General and Chief of the Navy Bureau of Medicine and Surgery. 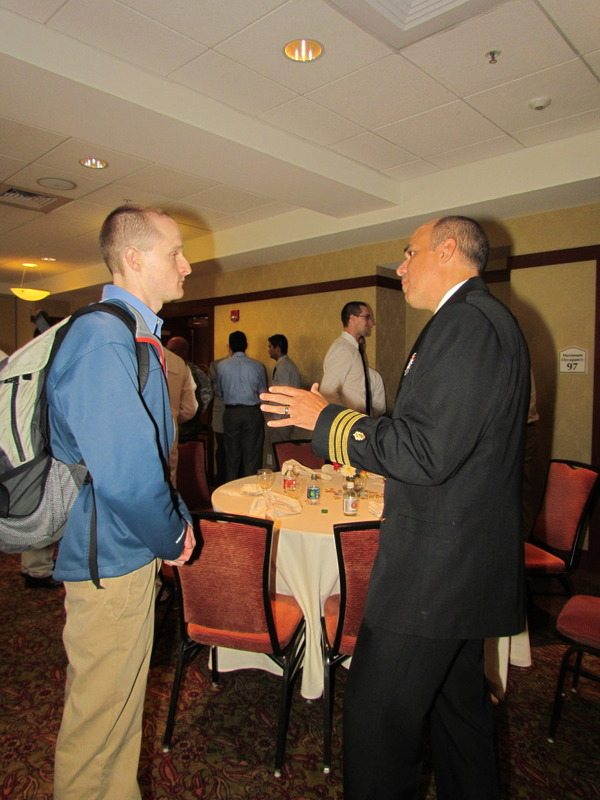 Since retirement from the Navy he has been a professional services and information technology consulting executive for Oracle, Inc., BearingPoint, Inc., and currently at Deloitte Consulting LLP. Last week, I was in Washington DC for a family visit. While there, I was witness to a significant “coming” and a significant “going” in Naval history. At the weekend, I attended the Naval Historical Foundation annual meeting. Introduced there was the new (“interim”, or so he’s characterized on his LinkedIn page) Director (as described on its website) of Naval History at the Naval History and Heritage Command, Captain Henry J Hendrix II, USN. Captain Hendrix actually was appointed to his post in May. He told me he had a two-week in-brief by his predecessor, RADM Jay DeLoach before stepping in to the leadership role at the Navy’s flagship historical establishment. Captain Hendrix has Masters Degrees in National Security Affairs – Middle East (Naval Postgraduate School) and History (Harvard), and a PhD in War Studies (University of London). He’s an adjunct Assistant Professor at Georgetown, where he teaches a course in strategy, policy, technology and security in government. He’s written for the Naval Institute for more than 10 years, and recently, Captain Hendrix served on a board offering strategic advice to the Secretary of the Navy. All this seems good preparation to lead the organization that’s responsible for accessing, restoring and preserving an immense amount of documents, artifacts and (now) electronic records of historical importance to our Navy and Marine Corps. Also while in the DC, I attended a celebration for Jan Herman, who has retired after 33 years as Historian of the Navy Medical Department and editor-in-chief of its journal, Navy Medicine. Jan started his 42 years of federal service with a tour in the Air Force. He then joined the State Department as a public affairs writer and staff assistant. After coming to the Bureau of Medicine and Surgery, Jan curated the organization’s then-headquarters, the Old Naval Observatory located in the Foggy Bottom area of Washington DC. During his tenure, Jan wrote several books including Battle Station Sick Bay: Navy Medicine in World War II; Frozen in Memory: U.S. Navy Medicine in the Korean War; Navy Medicine in Vietnam: From Dien Bien Phu to the Fall of Saigon; and The Lucky Few: The Story of USS Kirk. More recently, he has become a media magnate, having produced a six-part documentary Navy Medicine at War and The Lucky Few: the Story of the USS Kirk. 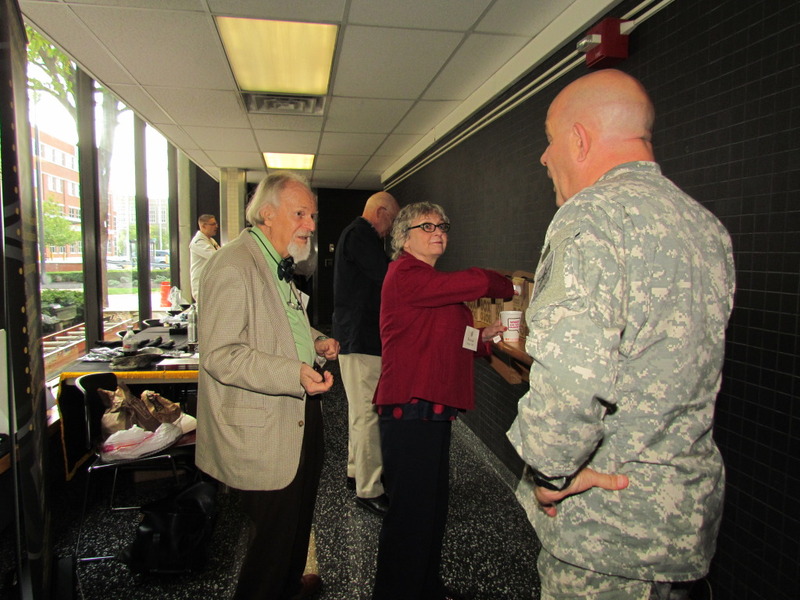 Jan also oversaw the Navy Medical Department’s oral history project for more than 25 years. Despite his retirement from federal service, Jan insists that he will remain active in the history field. Right now he’s working on a novel about the Civil War and its aftermath. On a personal note, this week I was installed as the first president of the newly chartered Rotary Club of Solano Sunset-Vallejo (California). I am humbled to have been elected to support our 30 mostly new Rotarians as they join 1.2 million other Rotarians throughout the world working to eliminate polio from the world through Rotary International’s “Polio Plus” program. In the 20+ years since Polio Plus was launched, the dread disease has been eliminated from every country in the world except Nigeria, Pakistan and Afghanistan. Rotarians throughout the world also work to support local charities, international scholarships (where Rotary is larger by far than , for instance, the Fullbright program) and a huge variety of other projects both local and international.